It’s not uncommon in the theatre world to come across a show that is based on the hit film. Legally Blonde, Once, Ghost, The Lion King, Billy Elliot, Sister Act, Priscilla Queen of the Desert, The Wedding Singer… the list goes on. However, it is a little more uncommon to hear that a play is based on the film, inspired by the film, which was based on the play’. Well this is the case for our production of His Girl Friday – a work which has had a long and colourful life in many different forms. 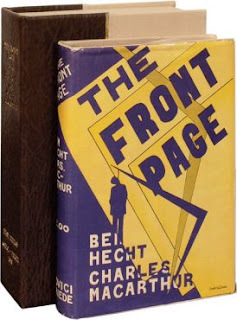 In 1928, a new play called The Front Page hit the Broadway scene. It was based on the day jobs of Chicago reporters Ben Hecht and Charles MacArthur; Hecht had reported for Chicago Daily News, which inspired the fictional newspaper in the play, while MacArthur was a reporter at the City News Bureau of Chicago, on which the set was modelled. A huge success, The Front Page ran for 278 performances and has since been revived three more times on Broadway. In 1931, The Front Page was first adapted for the screen. It was directed by Lewis Milestone, an Academy Award-winner with many well-known films to his name; several of which have been remade over the years, including Oceans Eleven and All Quiet on the Western Front. Backed by maverick producer (and legendary aviator) Howard Hughes, The Front Page received three nominations at the Fourth Academy Awards: Best Picture, Best Director, and Best Actor for Adolphe Menjou, who played Walter Burns. 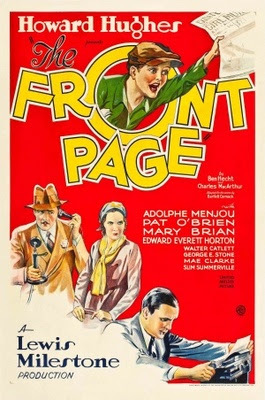 The poster for the 1931 film The Front Page. Nine years later a new film adaptation was released entitled His Girl Friday. Along with the title change, there was also a noticeable casting change – Hildebrand ‘Hildy’ Johnson became Hildegard ‘Hildy’ Johnson, now a part for a leading lady. Apparently during auditions director Howard Hawk’s secretary read Hildy Johnson’s lines and, liking the way the dialogue worked with a woman in the role, changed the script to make Hildy the ex-wife of editor Walter Burns. 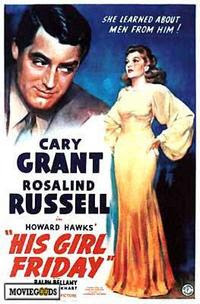 The film starred Cary Grant as Walter Burns and Rosalind Russell as Hildy Johnson. 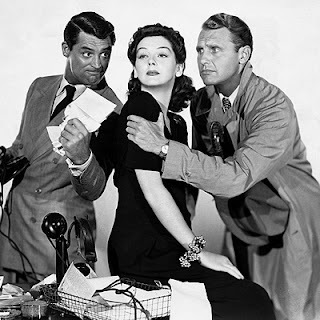 Cary Grant, Rosalind Russell and Ralph Bellamy in the 1940 film His Girl Friday. The Front Page was later made into two other films. 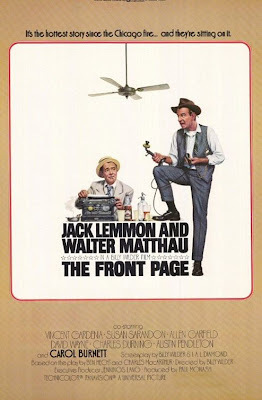 In 1974, Billy Wilder directed Jack Lemmon, Walter Matthau and Susan Sarandon in a remake of The Front Page. 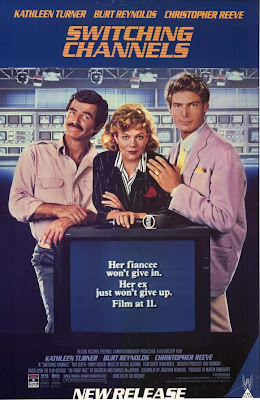 Then, in 1988 Christopher Reeve, Burt Reynolds and Kathleen Turner starred in Switching Channels, which used the plotline of His Girl Friday and updated the setting to a 1980s newsroom. Click the posters below to watch video trailers for each of the films. The poster for The Front Page (1974). Click to watch a trailer video for the film. Finally, in 2003, playwright John Guare meshed the original 1928 script for The Front Page with the screenplay from the 1940 film His Girl Friday, to create a new play – also called His Girl Friday. Confused yet? The stage version of His Girl Friday debuted at the National Theatre in London in 2003, with Alex Jennings and Zoe Wanamaker in the lead roles. 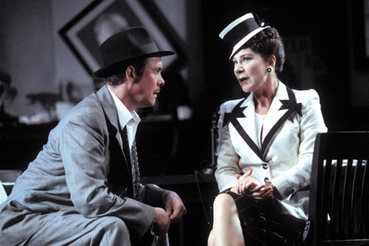 Alex Jennings and Zoe Wanamaker in the National Theatre production of His Girl Friday (2003). And early next month, the latest version of this classic comedy makes its Australian premiere at MTC. We’ll be sharing some more details of the production over the coming weeks – so stay tuned. In the meantime, we’d love to know which versions of The Front Page or His Girl Friday you’ve seen. You can share your favourites in the comments below. MTC’s production of John Guare’s adaptation of His Girl Friday is playing at the Arts Centre Melbourne, Playhouse from 11 August to 15 September.